As per the popular search engine Google, companionship is a noun that holds the definition “a feeling of fellowship or friendship.” It sounds an easy and subtle word yet it holds a crucial meaning to frail persons like the senior citizens. Reaching the golden years, seniors experience change, mostly for the worse. Their senses get weaker and their minds grow slower. Often than not, they become infested with diseases that hasten the deterioration of their body. Consequently, the impeding physical health issues affect their mental and psychological aspects too. They will need help now more than they did ever. How sure are you that your senior citizen loved one is eating balanced meals when he or she is left alone at home? How about their maintenance medicines? Getting companionship services will solve this problem. Assigned caregivers will make sure they are well-fed and that all prescription instructions are followed. Despite being homebound, it is still necessary for a senior citizen to move around. However, due to bone and muscle issues, the same proves to be difficult for them. To address this struggle, caregivers can serve as limbs for the immobile elderly. Either caregiver help move seniors around or become the gophers for their immediate needs. Plus, companions can perform light house chores. They can also manage the payment of bills and do grocery. Lack of personal hygiene is the leading cause of infection and other common diseases. When your senior loved one is no longer capable of keeping himself or herself clean every day, having a personal caregiver at home will work to his or her utmost advantage. The frustration of being unable to function properly coupled with penetrating body pains can turn into stress. This becomes lethal when endured alone. Caregivers can be someone your loved ones can hold on during tough times. After all, no man is an island. Lately, robbers have been targeting homes again. Their favorite victims? Senior citizens who are living on their own. Though caregivers do not offer the assurance similar to what personal security guards give, companionship service is still a commended option because thieves are discouraged from entering homes resided with able bodied individuals. 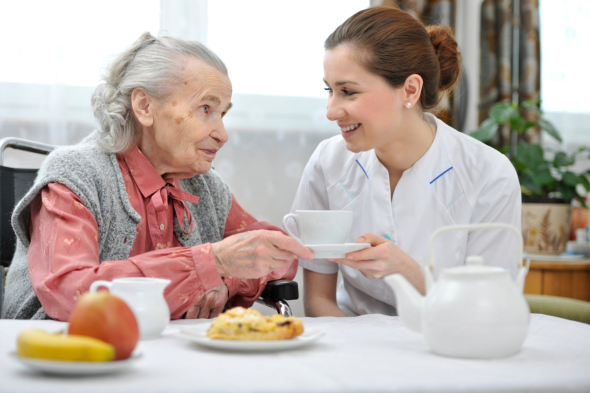 Companionship is a category under Home Care service. All other related services like Skilled Nursing, Personal Care, and Incontinence Care are incorporated under which too. To secure the maximum health and comfort of your senior loved ones at home, only get these services from the most acclaimed provider of Home Care Services in Philadelphia, Pennsylvania – AG Home Care Services, LLC. For your convenience, we made our services readily accessible. You may call 215-473-2030 or visit our website www.aghomecareservicesllc.com. You can also send an email to aghcs1217@gmail.com. This entry was posted in Home Care Services and tagged Certified Nursing Assistant, Home Health Aides, Nursing. Bookmark the permalink.